We spent almost 3 days at Magic Kingdom. Seriously, when we walked in and saw Cinderella’s castle, we were in awe. I think each day we were there we got the strawberry smoothie from Auntie Gravity’s Galactic Goodies. 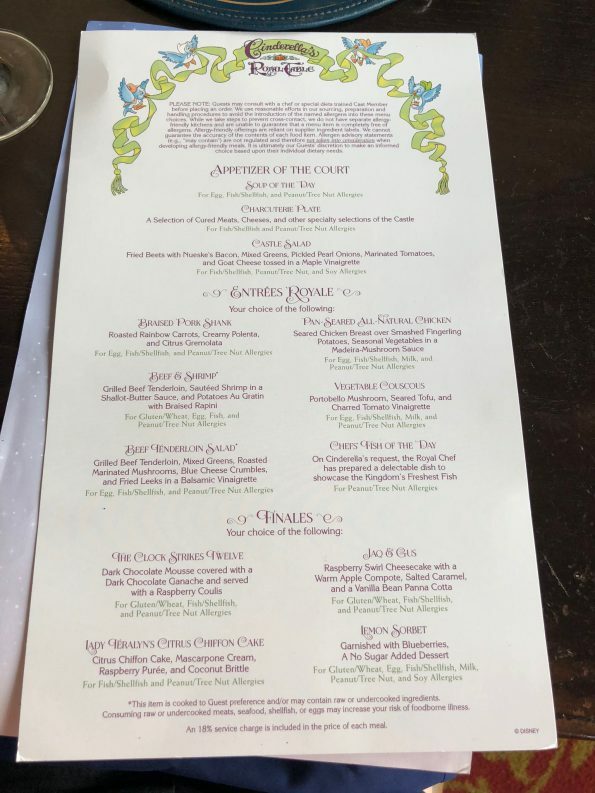 Cinderella’s Royal Table for lunch was one of the activities we talked about most leading up to our trip because it was “lunch with the princesses” for Lucy’s birthday! I started off with ordering a glass of wine and my waitress said, “Wine isn’t gluten-free. You know that, right? That’s what we learned in our allergy training.” For real. Here is an article explaining the thought that wine barrels are sometimes sealed with a wheat paste, which would make the wine not gluten-free. Anyways, I really wasn’t going to get into it with her…so I drank my glass of wine and enjoyed every sip. I was really kind of disappointed with the gluten-free options on the menu. It basically had one entree and then our waitress told us they could alter a few other items. 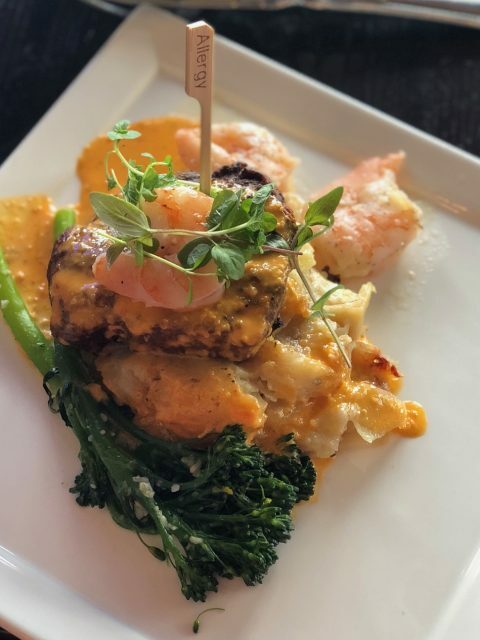 My surf and turf with au gratin potatoes ended up being delicious so it was all good! 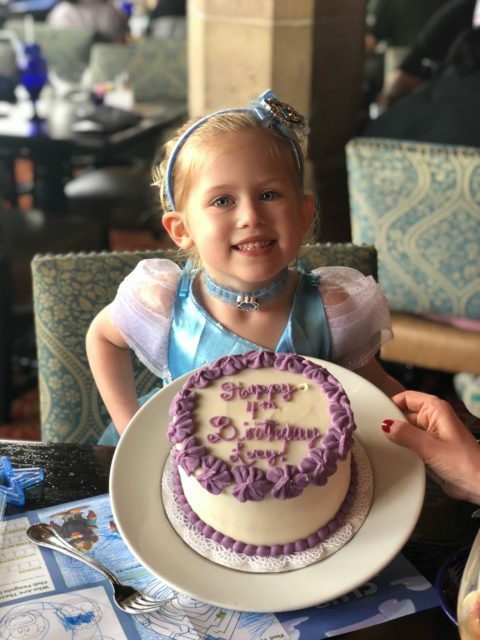 Also for Lucy’s special lunch, I called ahead to Erin McKenna’s Bakery in Disney Springs and had a gluten-free and vegan birthday cake made for her. That way I could enjoy her cake, too! They deliver to certain areas of the parks which is great. I honestly probably wouldn’t do that again, only because we had so much cake left over! The smallest cake they have serves 6-8 and we only ate about two servings since the kids don’t eat much. Lucy is really into cakes and talks about her birthday cakes for months before her actual birthday so this was something special for her. Maybe next time I would order individual cupcakes (or just order something off the menu). For breakfast on our last full day we went to Be Our Guest which is set up to be like the Beast’s castle. It’s considered a quick-service where you order your food from a kiosk and then they bring your food to the table. 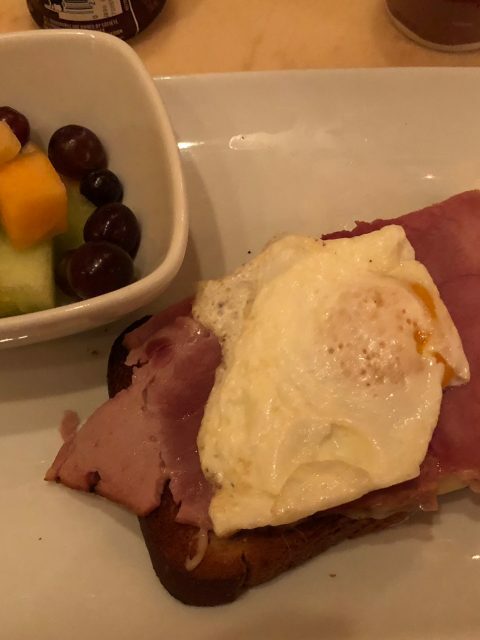 They did have some great gluten-free options for breakfast. 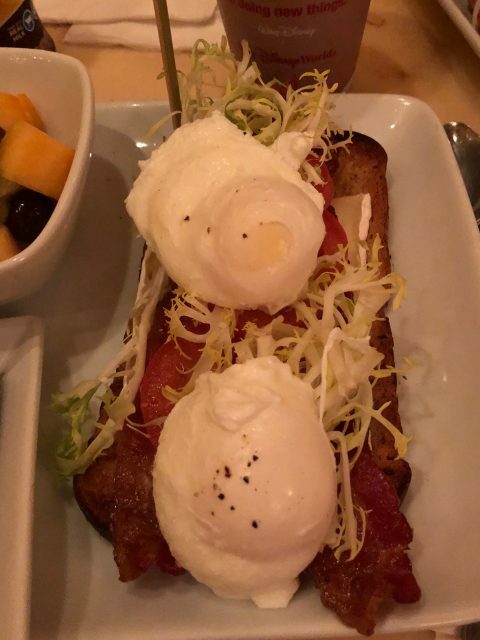 I ordered the open-faced bacon sandwich with brie and Brian got the croque madame. 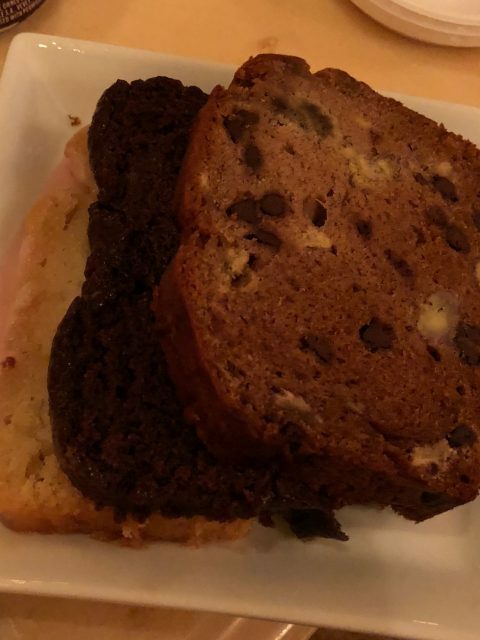 Both of our meals came with three slices of sweet breads which I’m almost positive came from Erin McKenna’s Bakery because the lemon cake slice with pink frosting was EXACTLY like the one I had purchased there a few days earlier. We really pushed it on our last day and probably shouldn’t have gone back to Magic Kingdom, but we wanted to squeeze a few more things in. All of us were tired and cranky then I had a hard time finding a safe lunch after going too long without food. Hot, tired, and hungry is NEVER a good combination for me. I, along with 7000 other parkgoers, ended up getting lunch at Pecos Bill Tall Tale Inn. Let’s just say I was crying over my lunch (literally) feeling sorry for myself while eating Uncle Ben’s microwave rice, black beans, plain grilled chicken and Pace salsa. Allergy food there was bad! I ordered the southwest burger for Brian which came on a gluten-free bun. It was literally a plain burger patty. Nothing else. What makes that “southwest”? On a final note: Magic Kingdom does not have any alcohol stands in the park, only within the sit-down restaurants. My husband actually noticed that he didn’t see people walking around with drinks like at the other parks so we googled it and sure enough he was right (he usually is). Also, if you make a reservation at a sit-down restaurant and then do not cancel within the 24 hour timeframe, you’ll be charged $10 per person. That happened to us! Hi Elsa!! Thanks for your notes!! I love that you have had such good experiences at Pop Century! That’s amazing when you receive such good customer service and you really feel like someone cares. I definitely think that our experience at Peco’s Bill was an “off” situation. We were there at the busiest time of day right at high noon and there were SO many people there. I was also hangry so I think I was in a bad mood. 😉 Good tips about the dehydration!! I’ll remember that for our next trip there. My daughter keeps talking about going for her 5th birthday and I have to remind here that going to Disney World is kind of a big deal and we can’t do it every year…but we are thinking about surprising her! Again, thank you for reaching out! Always! 🙂 WDW is totally a huge deal!! Especially since it is getting harder and harder to score fabulous deals. We love the AP because the AP discounts were formerly pretty deep & we would go at least twice on an AP, making it a great deal – especially once you included the discounts! Discounts last year were a little slim, but we’ll see what happens in the future. (fingers crossed!) 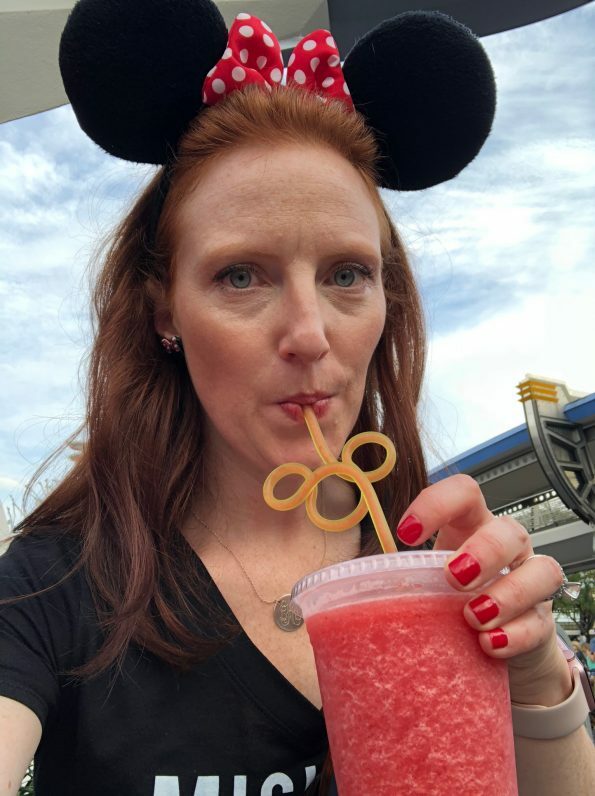 It also helps because my sister-in-law is a Disney travel agent and she keeps her thumb on the pulse of the savings & will stay on the phone all night grabbing the best deals for her clients & us! She has really been a God-send after our Celiac diagnosis because she handles a lot of allergy issues for clients – who knew that people with allergies could have their rooms deep cleaned prior to arrival?!? I didn’t! The beautiful thing about Disney is that it is the one place where, as a Celiac family, we can vacation without stress. In over 8 trips since diagnosis she has only been glutenated twice (in the same trip)! I never take it for granted though, I run through my whole spiel and advocate. Every. Single. Time. I think it’s easier to fight for my daughter than if I was the one with Celiac… I would have eaten what was on your tray at Pecos Bill too – because we are absolutely there with your “hangry” in our house – but when it comes to her it is easier to go that extra mile and keep at it until it is right. Mama bear instinct, maybe. Do you find it harder to advocate for yourself than if it were one of your children? I am really working on empowering my daughter to speak up for herself, but it does not come naturally and she often time settles…. so, that is something we are working on right now. 🙂 Your thoughts? I just found you blog and am so glad!! We are Disney nuts too (AP holders) and my daughter and husband both have Celiac. I am so sorry you did not have a good experience with Pecos Bill’s – that is our favorite! 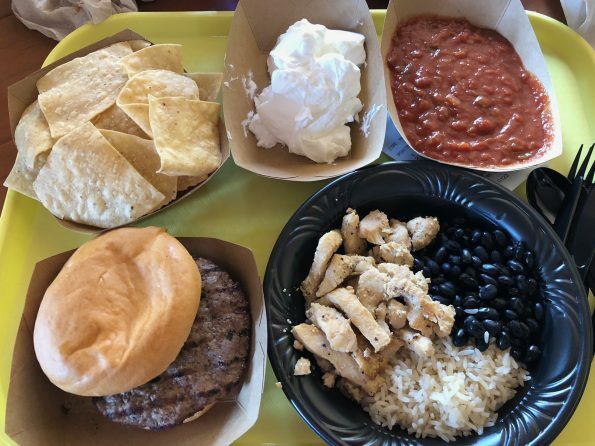 My daughter always gets what you did – the rice bowl with beans and chicken, except we ask them to please bring from the back all of the sides that she can have – which is pretty much everything on the fixings bar – including the guacamole, her favorite! Add the Strawberry-Lemonade Slushie and she is set! I always get the salad and my husband gets the burger too – but again, both with ALL the fixings from the back. I can’t hardly finish my salad there is so much stuff! I looked at you picture of what you had to eat on your tray and knowing how good it could have been, I literally wanted to cry for you!!! So sad!! Some places are definitely better than others at WDW and that changes greatly when they shift Chefs or Managers around. Right now we actually stay at Pop Century because of two AMAZING chefs there!! Jerry and, oh dear, his name is slipping my mind, but he is the best – tall, soft spoken, with glasses. I am so glad that long ago we decided to stay where we had the best luck with chefs (we’ve stayed in 6 or 7 different Disney resorts), because my daughter got really sick and ended up in the hospital due to dehydration/electrolyte imbalance and a virus last year on one of our trips and I was genuinely worried about what to feed her. You know how it goes, no appetite, no car to get favorites – and I didn’t want to leave her anyway. Those two chefs, especially the one I cannot remember his name at the moment (Grrr!! ), custom made her food!! The first night when we got back from the hospital, I went down to find her something and he had slow cooked GF bone broth for her because he knew she was sick!!! 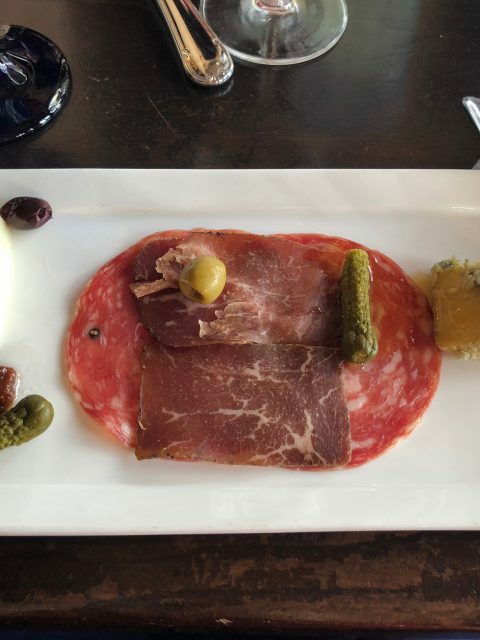 He followed with something like that for the remaining three days each meal. Those two chefs at Pop Century really take care of their GF guests above and beyond any where else we have stayed. I know it’s a value resort, but they make our vacations AMAZING!!! Another example of their amazing-ness is that the hot chocolate from the machines on property is not gluten free, so during our winter trips they will make my daughter a “special” hot chocolate from the back – complete with whip cream – totally for free because we buy the mugs. I just cannot express how much I love those guys and their team! And, the woman who is a manager there is top notch too – just so kind and attentive to guests. Best wishes on your future travels! Seeing your princess reminds me of mine when she was young! Enjoy every moment! !